Simply a tube of fabric with a curved seam, a pouch sling is a sleek carrier option. Sometimes called "tube," "pocket," or "ringless" slings, these are generally formed by a wide piece of fabric sewn into a tubular shape. Simple, or fitted, pouches do not have rings or other hardware. Adjustable pouches may adjust with zippers, snaps, buckles, clips, rings, drawstrings, velcro, and other methods. Most pouches have a curve sewn in to shape the cloth to the parent's body and hold the baby more securely than a simple straight tube. Fabrics are usually medium weight, like linen. 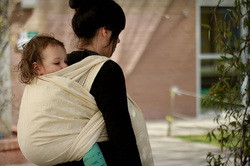 Slings that incorporate stretchy materials are not ideal because they cannot hold baby in the proper position during use. While usable with newborns, many moms find these more fitting once their postpartum weight stabilizes. Because they are size-specific, fitted pouches may not be interchangeable between parents and other caregivers and can be out-grown by baby, requiring a new one. Adjustable pouches, however, lose some of the sleekness that makes the pouch desirable. Proper sizing and use of pouches is important. Baby must be worn high on the caregiver’s body and care should be taken to ensure baby does not settle into the “C” position and baby’s airway remains open. Older babies and toddlers can ride in the tummy-to-tummy or hip carry positions. The weight-bearing seam must be inspected often for wear as well as any fasteners. Note that a mesh section does not provide sufficient air flow for baby to breathe. Deeper slings that cover baby’s head and face should be avoided. In its simplest and most elegant form, a ring sling is a shawl with a pair of rings attached to one end. The rings replace the knot or tuck-and-twist method of fastening used with traditional shawl carriers such as Mexican rebozos or Indonesian selendangs. Some ring slings have padding where the sling rests on the caregiver's shoulder or along the edges of the sling, and some depart further from traditional shawl carriers by having the fabric at the end of the sling folded and stitched into a rope-like tail. Variation is also found in how the rings attach to the cloth, commonly referred to as "shoulder style". Basic shoulder styles include gathered, pleated, "hot dog" or "center fold", pouch-style (folded in half) and many variations. Some "hybrid" ring slings have curved seats sewn into the body, similar to the seam in a pouch. Most ring slings are made with a woven fabric but may also be made of stretchy materials. Materials used can range from gauze to denim and can be found in various lengths. Since ring slings are adjustable, having extra material is common. The tail can be used to tie a bow or a flower for decoration. You can also use the tail to cover an over-stimulated baby, shield during nursing, or attach a teething toy to so when the baby drops it (and they will) it does not hit the floor. Many babywearers will have a beloved wrap converted into a ring sling (or two) because of the versatility of a ring sling. Ring slings use dynamic tension to secure baby to the caregiver. This means that the weight of the baby actually locks the fabric in place; the more tension against the rings, the more secure it is. Rings are commonly made of aluminum or nylon. Both materials repel radiant heat which is essential, especially in warmer climates. This is an important safety issue to consider when choosing a sling. Some cheaper slings have plastic rings or molded rings. These should be avoided when possible as the rings can break after moderate use causing risk of laceration. All ring slings, regardless of materials should be inspected regularly for wear including both the rings and stitching. 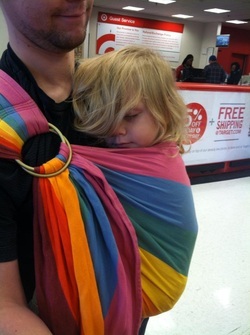 Wraps (sometimes called "wraparounds" or "wraparound slings") are lengths of fabric (usually between 2.5-7 yards long, and 15-30 inches wide), which are wrapped around both the baby and the caregiver and then tied. A baby or toddler can be carried on the wearer's front, back or hip. With shorter wraps it is possible to do a one-shouldered carry, similar to those done with a pouch or a ring sling, although most carries involve the fabric going over both shoulders of the wearer and often around the waist to offer maximum support. There are two main types of wrap: stretchy and woven. Stretchy wraps are generally made of knits such as jersey or interlock. It is easy to take babies in and out of a stretchy wrap. This can be easier for the wearer as the wrap often remains tied on and the baby is lifted out and put back in as required. Several factors influence stretchiness: carriers with any spandex or Lycra content will tend to be very stretchy, carriers which are 100% cotton or other natural fibers will tend to have less lengthwise stretch. Woven wraps are pieces of woven fabric of varying thickness ranging anywhere from gauze to denim. Natural fibers are usually chosen, with cotton being the most common, but hemp, linen, silk and wool are also used and have very little give or stretch. Stretchy wraps often have a lower weight limit than woven wraps because of the lack of support. Caregivers will begin to feel more strain as the child reaches 15-20 pounds. With the exception of specific hybrid stretchies such as the Wrapsody and the Je Porte Mon Bebe, stretchy wraps are not intended for back carries. The lack of support from a stretchy wrap and lack of supervision can create a dangerous situation for a child. The bei dai or meh dai (bei dai in Mandarin; meh dai in Cantonese) is a traditional Chinese baby carrier made of a square or rectangular body panel with four straps sewn on, one to each corner. Two of the straps are used to secure the carrier to the wearer's waist, and the other two are used to secure the carrier to the wearer's shoulders. The modern bei dai has a bevy of add-ons such as padded shoulder straps or padded waist straps, wrap-style shoulder straps, hoods, pockets, embroidery, and rings on which to attach pacifiers or toys. The mei tai can be worn on the front or the back, and one mei tai can be easily used between multiple caregivers. Other Asian-style carriers are the podaegi, a Korean carrier which has long shoulder straps but no waist straps, and the onbuhimo, a Japanese carrier which substitutes rings for the waist straps, allowing the shoulder straps to be threaded through and used to secure the bottom of the panel. The most popular baby carrier in the United States is the soft-structured carrier, also called a buckle carrier. Like the bei dai, the SSC has a body panel and shoulder and waist straps. SSCs replace knots with buckles and add a thickly padded waistband and shoulder straps. The result is a different weight distribution and overall different look and feel from a mei tai, putting this style of carrier into a category of its own. Soft-structured carriers offer the convenience of buckles, yet are vastly different from framed backpacks in that they hold the baby securely against the wearer's body. Unlike framed backpacks, soft-structured carriers are suitable from birth through toddlerhood; most are rated to over 35 pounds. SSCs also provide the benefits of body-to-body contact for the baby (although some require or include a special insert for newborns). SSCs are built like a backpack, with a wide, padded hip belt that distributes the baby's weight to the wearer's lower body, and two well-padded shoulder straps. They fasten with a waist buckle and a chest clip, and have adjustable webbing on the waistbelt and shoulder straps to accommodate a wide range of body sizes. Most SSCs allow for both front and back carries and easily switch between the two. The exception is the front pack (FP). These carriers are designed for front wear only and allow for both inward and outward facing positions, and generally encourage the forward facing out position.